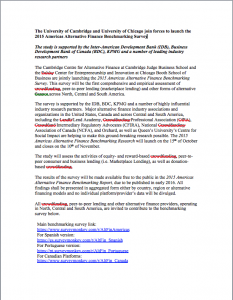 This research is led by the Cambridge Centre for Alternative Finance, Cambridge Judge Business School. The Cambridge Centre for Alternative Finance is an international, interdisciplinary, academic research institute, dedicated to the study of alternative finance, which includes financial channels and instruments that emerge outside of the traditional financial system (i.e. regulated banks and capital markets). The University of Chicago Booth School of Business is consistently ranked among the top five business schools in the world. The school’s faculty includes renowned scholars and its graduates occupy key positions in the US and worldwide. The Chicago Approach to Management Education is distinguished by how it leverages fundamental knowledge, its rigor, and its practical application to business challenges. The school offers full and part-time MBA programs, a PhD program, open enrollment executive education and custom corporate education with campuses in Chicago, London, and Hong Kong.